Ligier Richier was born in Lorraine at the beginning of the XVIth century – many well-known people gave him commissions. He became a convert to Protestantism and took refuge in Geneva, where he lived until his death . Little is known about Richier’s early life, other than the fact that he was born in Saint-Mihiel (Meuse), and got married in the duchy of Lorraine, which was independent from the Royal Kingdom of France at that time. As an artist, he was first mentioned in 1530 in a document in which we learn that the duke of Lorraine admired his talents and wanted to give him commissions. Richier’s biography has contained inaccurate facts for a long time – this now needs to be put right. For example, he never went to Italy and neither did Michelangelo meet him in Lorraine. His conversion to Protestantism is clothed in mystery. All we know is that in 1560, with the other inhabitants of Saint-Mihiel, he signed a petition to the duke in order to obtain permission to practice the reformed religion. He probably had to leave the duchy of Lorraine because of the instructions against heresy published by the bishop of Verdun after the Council of Trent. At the beginning of 1564 he was still living in Lorraine, but in October of that year he was already in Geneva, where he joined his daughter Bernadine. She had married Pierre Godart, another protestant who had also been forced to leave Lorraine because of his religious beliefs. Richier remained in Geneva until his death in 1567 – he left behind him a considerable fortune. Ligier Richier, descent of the Cross 16th century © S.H.P.F. The artist’s first well-known work was the altar-piece of Hattonchâtel dated 1523. This shows a gothic influence in the way the scenes are treated and a Renaissance influence in its architectural and ornamental structure. Its subject is Carrying the Cross, The Crucifixion and Grief at Christ’s Death. Due to the date of this work we can make a calculated guess that Ligier Richier was probably born at the beginning of the XVIth century. In the Calvary of Saint Stephen in Bar-le-Duc (about 1532) the agonized expression on the faces of the robbers is in contrast with the calm expression emanating from Christ himself. A similar opposition can be seen in the Calvary in the church of Saint-Gengoult de Briey (before 1534). However, in the latter, three figures have been added : the Virgin Mary, Jean and Madeleine. 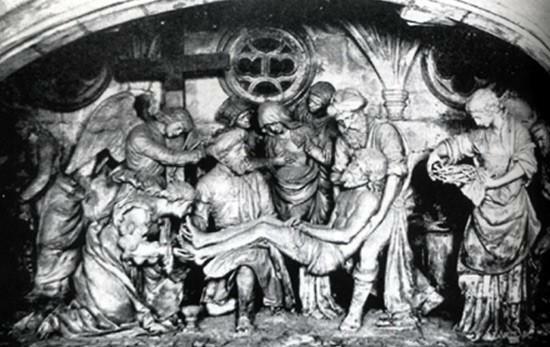 The Burial Scene, in the church of Saint-Etienne de Saint-Mihiel (before1564) is one of Ligier Richier’s most famous sculptures. It consists of thirteen full-size sculptures, richly clothed, their faces showing deep emotion, which has been brilliantly expressed by the artist. Probably the most well-known work by Ligier is to be found in the church of Saint-Etienne in Bar-le-Duc. This is the Memorial to the Heart of René de Chalon (after 1544 and before 1557). We can see a striking full-length figure of a man standing upright, clutching his heart in his hand. His emaciated body is still covered by a few shreds of skin – indeed, this haunting image can be seen as a symbol of Christ’s resurrection, according to Michèle Beaulieu. The sculpture comes from the collegiate church of Saint-Maxe in Bar-le-Duc, which was abandoned in 1782. Other works to have come from the same place are Jesus as a Child and The Head of Saint Jérôme, both in the Louvre Museum, as well as the small sculpture entitled Christ’s Head, to be found in the headquarters of the Société d’Histoire du Protestantisme Français in Paris. The Recumbent Figure of Philippe de Gueldre, the second wife of René II of Lorraine, who died in 1547 is now in the historical museum of Lorraine in Nancy. Delacroix himself, when he came to the museum, was struck by the brilliant realism of the face and hands.